Pakistan's quest for democracy under civilian rule has produced neither democracy nor development in the Islamic country of over 180 million people. Currently, Pakistan is experiencing 6th consecutive year of stagnant economy and human development under an elected but highly corrupt "democratic" government run by the Sharif family and their cronies for their own benefit. Can one call it a rule-of-law or democracy when the Sharifs illegally order the Lahore police to attack the home of Allama Tahir ul Qadri, kill over a dozen unarmed civilians including women, and then refuse to file a report (FIR) of the incident at the local police station? Can you call it constitutional rule when the ruling politicians openly defy the Supreme Court orders to hold local government elections under Article 140 (A) of the Pakistan constitution? Is it democracy when all of the most powerful government positions are held a few members of the Sharif family and their close friends? 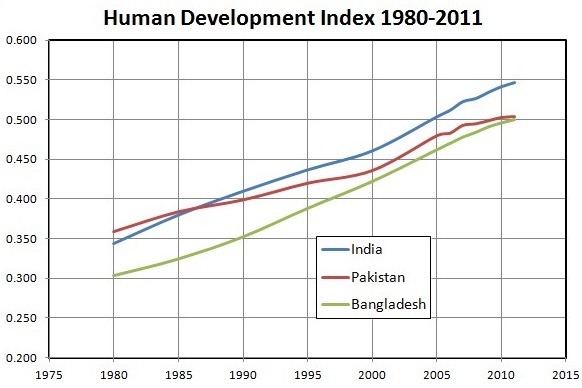 Is it development when Pakistan's human development progress is the slowest in decades? Is it development when Pakistan faces another lost decade like the decade of 1990s under PPP and PMLN rule? 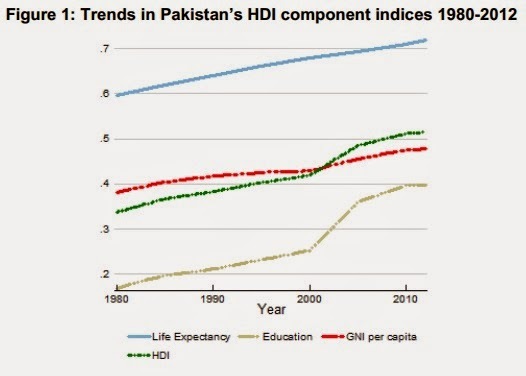 Is it development when Pakistan continues to drop in world rankings on social indicators included in the UNDP's HDI index? Civilian rule in Pakistan has delivered neither democracy nor development. The country stands at a crucial juncture with highly energized Pakistanis staging a historic massive sit-in in Islamabad since August 14, 2014. They have shaken up the ruling Sharif family and forced them to seek Pakistani military's help to save themselves from the wrath of the people. Any decisions made by Pakistan's military and politicians now will have long term impact on the health of the country. Let's hope these decisions bring about changes which help accelerate socio-economic development while making Pakistan's rulers more accountable and responsive to the people for their actions. Pakistan PM Invites Army Intervention; Can Army Chief Save Nawaz Sharif Govt? from WBT TV on Vimeo. What If Musharraf Had Said No? 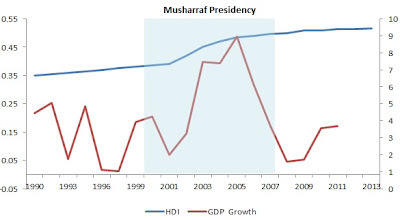 Musharraf did well because he was heading a stable govt. there was no imran khan or qadri. The point is whether pakistan wishes to be a democratic state or a military state. Fortunately, the founding fathers of pakistani constitution chose democrazy. Therefore it not open even to pakistanis to go back on this. Instead pakistanis should inculcate the japanese type harworking qualities and succeed. Hardwork will never fail. US President Richard Nixon won his second term in a landslide. Yet, he was forced to resign because he was suspected of ordering burglary of his opponents' party headquarters in Watergate. Sharif brothers in Pakistan are suspected of something far more egregious: Ordering police to attack TuQ's home and murder a dozen un-armed civilians in the dead of night. And then refusing to register a case. It calls for Sharif brothers ouster if they do not voluntarily resign. Chronicle of a Political Suicide Foretold: Ask the army chief to act as mediator between government, Imran Khan and Tahirul Qadri, and stand guarantor to any agreement. Chief agrees and separately meets both leaders who insist they will not back down from their demand for Nawaz’s resignation. Nawaz discovers it hasn’t worked and tries to throw the chief under the bus by denying that he asked the chief to mediate. The army spokesman confirms that the government asked the chief to do so. Now wait for the army to throw Nawaz under the bus. I am not sure the Military regime should be applauded here. Yes there is not much to say about the civilian government either. The Asian Tiger Miracle has to do more with savings rate and exports. Export policies have been the de facto reason for the rise of these four Asian tiger economies. The approach taken has been different among the four nations. Hong Kong, and Singapore introduced trade regimes that were neoliberal in nature and encouraged free trade, while South Korea and Taiwan adopted mixed regimes that accommodated their own export industries. In Hong Kong and Singapore, due to small domestic markets, domestic prices were linked to international prices. South Korea and Taiwan introduced export incentives for the traded-goods sector. The governments of Singapore, South Korea and Taiwan also worked to promote specific exporting industries, which were termed as an export push strategy. All these policies helped these four nations to achieve a growth averaging 7.5% each year for three decades and as such they achieved developed country status. Moin: "Export policies have been the de facto reason for the rise of these four Asian tiger economies"
Pakistani military govts also focused on expanding export. Pakistan's exports triple during Musharraf years 2000-2007. In 1969 as Ayub Khan's decade of development ended, Pakistan’s manufactured exports were higher than the exports of Thailand, Malaysia and Indonesia combined. I am appalled. I am appalled at the apathy of Pakistani society in not supporting for once what is clearly ( in my lifetime at lest ) the most serious and deep rooted attempt at reform. I am appalled at the pretentiousness of many otherwise perfectly logical and sane people, for not supporting this serious attempt to get rid of this terrible putrid sewerage system of so called democracy, so cunningly labelled by self serving politicians to safegurad their golden geese. These poliicians who have destroyed all semblance of good order and governance, simply because of this label of so called democracy. Look at these names who have been in political power in one form or shape or the other, be it a civilian or military administration. Look at this horrible horrible roll call. Nawaz Sharif, Shahbaz Sharif, Ishaq Dar, Saad Rafique, Asif Zardari, Khurshid Shah, Fazlur Rehman, Asfandyar Wali its an endless list of self serving, corrupt to the core, people. While some may criticise IK and TUQ for resorting to "undemocratic" methods. Here's something to ponder. What choice do IK and TUQ and and people like us have. We cant boot the Nawaz Sharifs and Asif Zardaris out through the electoral process because they have "bought" the entire process. We cant take them to court, because they have "bought" the entire judicial system. We cannot hold them for administrative impropriety. misgovernance, gross and blatant use of authority in appointments, misuse of public funds, corruption, brazen conflict of interest because they have "bought" the entire administrative structure. So IK and TUQ and people who want reform had and have no option but to resort to what they have done. Because, while theoretically we have a parliament and an elected government and there is due process for acquiring power, the system has been hijacked and held hostage by these "professional crooks" masquerading as political leaders. Look at Khurshid Shah thundering in parliament, earlier today and look at the sickening amount of ill gotten wealth he has acquired through corruption since 1991 when he was ifrst elected as am MNA. Can anyone justify this terrible and blatant hypocrisy and criminality. While some may not like IK's arrogance ( I do) or TUQ's Canadian citizen ship ( irrelevant). BUT If these two can set in motion the wheels of change for a better, prosperous Pakistan with strong institutions, especially the Police and the Judiciary, an electoral process which does not hand over power to a bunch of professional crooks with just 10 to 15 % of the registered vote, a system of political accountability which does not allow people in power to blatantly and brazenly misuse authority and public trust and public funds, and a country where no one Faith is imposed on another, I am all for it. And for those professional politicians with IK ( not many with TUQ) who think that they will benefit once again from the 'IK" bandwagon, as they have done on other bandwagons in the past...I think they are in for a surprise!! India has finished 71 in Global Competitive Index 2014-15, Pakiland has finished 129. Anon: "Thank God for partition!" 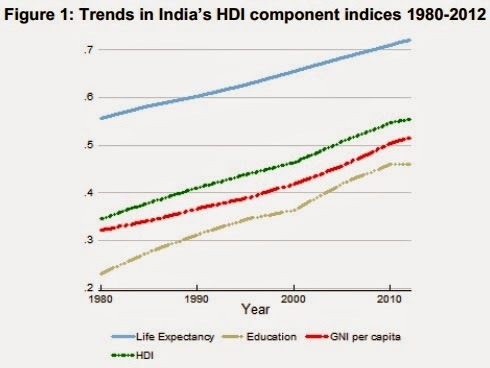 In spite of all of Pakistan's problems, an average Pakistan is better off than an average Indian today with lower hunger, less poverty, better health and hygiene. In a united India, Pakistani Muslims would fare much worse like the Indian Muslims who are the new untouchables. Civilian or Military rule, I just don't see that critical curve heading north. Riaz is unlikely to agree with you there he thinks Pakistan's problems can be solved by the fauj...these finer 'bookish economics' details don't interest him you see. Anon: "The Musharraf government followed an unwise policy of consumption-stimulated increase in economic growth. It proved short-lived and fuelled both inflation and balance of payments crises, which ultimately brought down the growth rate'"
He's absolutely wrong. 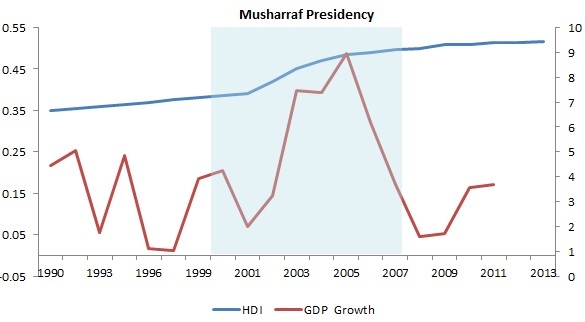 Musharraf era economy was fueled mainly by rising investments. 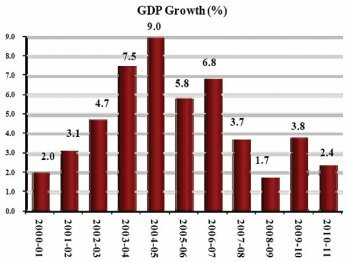 Domestic savings rate was about 18% and foreign direct investment reached $5.2 billion, or 3.5% of Pakistan's GDP. These investments fueled economic growth from 2000-2008. In my view, the activist judges led by former chief justice Iftikhar Mohammad Chaudhry have contributed significantly to the sharp decline in FDI and domestic investments in the country. Ayaz Ali stands outside the only school in his southern Pakistan village, struggling to recall the last time the lone teacher showed up. It was at least five years ago. The school is strewn with plastic bags, while urine stains and dried-out feces emit a foul smell. Since district education officials say the school is technically still open, Ali has no alternatives that he can afford. Ali’s plight shows how Pakistan’s government often poses a bigger obstacle to a quality education than Taliban militants who shot Nobel Peace Prize winner Malala Yousafzai in the face two years ago. One in three students now attends a privately run school, up 50 percent from a decade ago, as a failing public system produces one of the world’s highest truancy rates. The country has seven million children who are out of school, two-thirds of them girls, and most of them lack minimum mastery of math and reading, according to a World Bank report in April 2014. Pakistan ranked 113 of 120 countries on the United Nations’s Education for All index. Pakistan is a young country, with a third of its population less than 15 years old. Even so, spending on education fell for a second straight year to 2.1 percent of gross domestic product in 2012, among the lowest in the world, according to the latest available data from the World Bank. That’s about half as much as the nuclear-armed nation spends on its military, budget documents show. Since his election in May 2013 Prime Minister Nawaz Sharif has focused on stabilizing an economy hit by a power crisis that curbed growth. Provincial governments are responsible for overseeing education, according to the constitution. Ali’s school in Allah Warayo is typical of government-run schools, which are often in decaying buildings that lack running water, toilets or proper furniture. Teachers are frequently absent or don’t attend at all. Private schools are increasingly filling the gap. Pakistan now has more than 150,000 for-profit schools, at least 25,000 madrasahs and hundreds of other non-profit schools. That compares with 233,300 public schools, according to the government’s Economic Survey 2014. Elite private schools in well-to-do sections of big cities can cost as much as 30,000 rupees ($300) a month. These offer better salaries to attract highly qualified teachers and provide a good standard of education. Politicians often stand in the way, said Atta-ur-Rahman, a former chairman of the constitutionally mandated Higher Education Commission. Poorly qualified teachers are routinely hired as a way to dish out favors in return for votes. In Allah Warayo village, Ali is stuck toiling in the fields as he waits for his school to reopen. The World Bank (WB) has categorised the PTI-led Khyber Pakhtunkhwa on top among all four federating units of Pakistan for making progress in different areas of human development. “Pakistan’s provinces have experienced very different levels of progress in human development over the last decade. Khyber Pakhtunkhwa seems to have made the most progress in a number of areas,” the WB’s report titled “Pakistan Development Update” states. According to the WB, the gross primary enrolment rate in the KP increased three percentage points between 2010 and 2015, in a period when other provinces were deteriorating. The child immunisation rate in KP increased from 40 percent in 2005 to 53 percent in 2013 and 58 percent in 2015, the largest increase of all provinces over that time period. Sindh, on the other hand, appears to be flat-lining across the same indicators. Child immunisation was lower in 2015 than it was in 2005 (45 and 46 percent respectively) and the gross primary enrolment rate also fell from 82 percent in 2010 to 79 percent in 2015. Stunting in Sindh also remains very high. Sindh continues to face large differences in urban and rural outcomes, which are most stark in water and sanitation where only 31 percent of rural households have a flushing toilet compared with 97 percent of urban households. Only 23 percent of Sindh schools are equipped with basic facilities compared with 93 percent in Punjab, 44 percent in KP and 26 percent in Balochistan. Punjab has had mixed success while Balochistan has struggled. The data suggests that Punjab is also stagnant in some of the social outcomes over recent years. Its improvement falls between Sindh and KP, having made steady progress on child malnutrition (particularly stunting), as well as child immunisation and rural sanitation while making little or no progress on enrolment rates and the quality of learning outcomes. Balochistan has struggled to increase its particularly poor outcomes, seeing deterioration in learning outcomes (only 33 percent of year 5 children could read a story in 2014) and child immunisation. Gender equality is improving somewhat – from a low base – in education and the workforce progress on women’s empowerment is also mixed. While gender inequalities persist, women are slowly participating more in education and work. Female labour force participation is slowly increasing, albeit from a low base (from 19.3 percent in 2005 to 24.8 percent in 2014) and more girls are completing lower secondary. The ratio of female to male literacy is steadily improving, with seven literate women for every 10 literate men in 2015. This ratio differs wildly across provinces, however, with Balochistan exhibiting only four literate women for every 10 literate men. Population growth is a key challenge for service delivery. Looking forward, population growth presents a key challenge for all areas of human development. 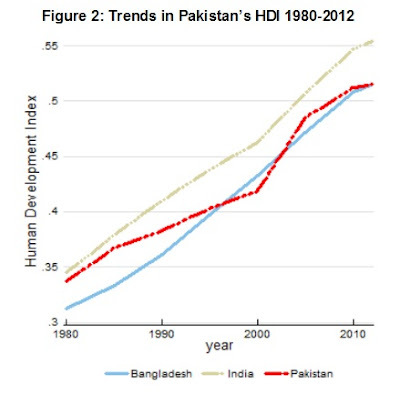 Systems are not expanding quickly enough to increase access and coverage to Pakistan’s fast-growing population. Service delivery strategies will need to take a long-term view if services are to capture a greater share of a growing population while also improving quality, the report concluded. “A politician who meets even one of these criteria is cause for concern,” Steven Levitsky and Daniel Ziblatt, both professors at Harvard, write in their important new book, “How Democracies Die,” which will be released next week. We tend to assume that the threat to democracies comes from coups or violent revolutions, but the authors say that in modern times, democracies are more likely to wither at the hands of insiders who gain power initially through elections. That’s what happened, to one degree or another, in Russia, the Philippines, Turkey, Venezuela, Ecuador, Hungary, Nicaragua, Sri Lanka, Ukraine, Poland and Peru. A survey that year found that the Venezuelan public overwhelmingly believed that “democracy is always the best form of government,” with only one-quarter saying that authoritarianism is sometimes preferable. Yet against their will, Venezuelans slid into autocracy. Likewise, the authors say, no more than 2 percent of Germans or Italians joined the Nazi or Fascist Parties before they gained power, and early on there doesn’t seem to have been clear majority support for authoritarianism in either Germany or Italy. But both Hitler and Mussolini were shrewd demagogues who benefited from the blindness of political insiders who accommodated them. Let me say right here that I don’t for a moment think the United States will follow the path of Venezuela, Germany or Italy. Yes, I do see in Trump these authoritarian tendencies — plus a troubling fondness for other authoritarians, like Vladimir Putin in Russia and Rodrigo Duterte in the Philippines — but I’m confident our institutions are stronger than Trump. It’s true that he has tried to undermine institutions and referees of our political system: judges, the Justice Department, law enforcement agencies like the F.B.I., the intelligence community, the news media, the opposition party and Congress. But to his great frustration, American institutions have mostly passed the stress test with flying colors. This is risky but I am going to argue it anyway. I strongly believe that liberal democracy is the best way to run a country. People like me, who believe this, are often tempted to argue that democracy leads to, or its even a requirement for, other good things, like peace, social progress, health improvement, and economic growth. But here's the thing, and it is hard to accept: the evidence does not support this stance. 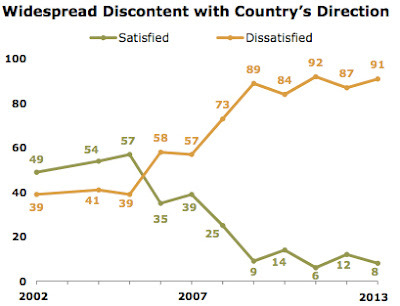 Most countries that make great economic and social progress are not democracies. South Korea moved from Level 1 to Level 3 (Rosling divides countries into 4 levels in terms of development, not the usual two categories of developed and developing) faster than any other country had ever done (without finding oil), al the time as a military dictatorship. Of the ten countries with the fastest economic growth, nine of them score low on democracy. Anyone who claims that democracy is a necessity for economic growth and health improvements will risk getting contradicted by reality. It's better to argue for democracy as a goal in itself instead of as a superior means to other goals we like.